Though it was Bradley Prairie that defined and nurtured Burke, the surrounding timerlands also played an important role in the life of the community, especially the pines in the later industrial area.. 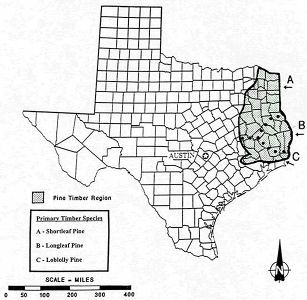 When settlers first arrived in southwest Angelina County, they found much of it covered by majestic longleaf pines ("B" in map below). Southern Angelina County was in a narrow belt of longleaf pines that stretched across the South from the Atlantic Coast into East Texas. Below this belt loblolly pines prevailed ("C"), and above it the short leaf pines ("A") were predominant. The longleaf belt provided an ideal environment to early cattle raisers because the widely spaced trees provided plenty of open ground that was covered by long stem grasses. The longleaf savannah was a unique environment in that it was a forest that was open enough to provide the grass of a prairie. After the timber industry arrived with the railroad, the longleaf pines provided a steady supply of feedstock to the early Burke sawmills and later the large Temple mill at Diboll. After the long leafs were all cut, the faster growing loblolly pine was planted and and is now the predominant species in Angelina County. The only large stands of longleaf pines left in the area are in Angelina National Forest in the far southeastern part of the county. The author recalls a few long graceful leaf pines on property his family rented just northeast of the airport north of FM 2108. Although its pines are loblollies, the grounds of Ryan Chapel Methodist Church probably provides a reasonably good idea of the appearance what the longleaf pine forest. Texas Beyond History Website, "Aldridge Sawmill-The Forests of East Texas"